Putty knives, steel blade putty knives, full tang blades, scrapers, retractable razor scraper, plastic razor blades. Additional hand tools are listed on the Hand tools page. See plastic putty knives on our Spreaders page. 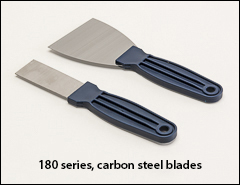 Other types of spreading tools are available on our Palette knives, spatulas page. We also have 5-in-1 painter's tools on our Chisel trim brushes page. 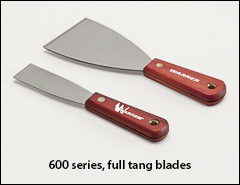 180 series putty knives. Carbon steel blade. Solvent-resistant, polypropylene contoured handle. For light duty projects. 10/box but sold in any quantity. 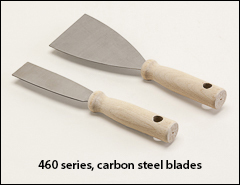 460 series putty knives with carbon steel blades and wood handles. Packed 10/box but sold in any quantity. 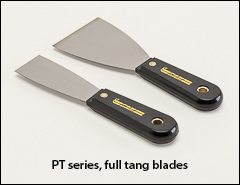 PT series precision ground, full tang, mirror finish, tempered high carbon steel blade with solvent-proof nylon handle. 10/box but sold in any quantity. 600 series 1074 high carbon-grade steel is hollow ground, heat treated, and annealed for toughness. Blades are polished and buffed to high luster finish for easier application and cleanup. Hardwood handles are moisture resistant. Full tang design. Chisel edge on all stiff knives. Flexible blades are 0.050" thick. More flexible blades available in this style. 5/box but sold in any quantity. 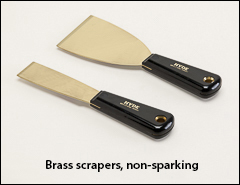 Solid spring-tempered, non-sparking brass blades resist corrosion. The blades are polished and lacquered. 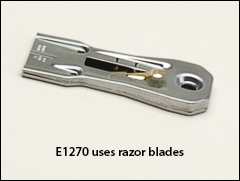 Durable nylon handles are locked into the blades with brass grommets to prevent loosening. 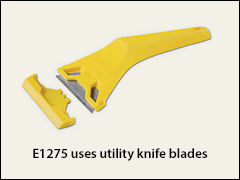 The E1225 is 12" long with a stiff polypropylene handle. 5 or 10/box but sold in any quantity. WARNING: Proposition 65 Label for brass scrapers . Plastic window scraper with an offset handle. 7" long. Uses the 11921 blades. WARNING: Proposition 65 Label for plastic scrapers and blades . Sturdy trigger action razor scraper with welded steel body. Single edge, steel back (folded over top of blade), #9 (.009 thick) blades. Scrapers are packaged 10/box but sold in any quantity. Blades are packaged and sold by the hundred. Plastic scrapers used to remove bits of hardened resin from the mold between cycles or when mold cleaning. Razor blade size scrapers: 1 1/2" wide x 3/4" high. Sold by the pack, 100/pack.